In case you haven’t noticed it’s almost Pi Day! While I am not a huge pie fan (cake girl over here… actually make that cupcakes! Yum!) I do enjoy a pie once in a while. For example, I made a yummy Rustic Pear Apple Tart last year for Pi Day! Unfortunately most commercial American pies are extremely sweet. Like, they are almost all sugar. That’s the main reason why I don’t eat them very much. I am used to eating less sweet baked goods – my mom has always reduced the sugar in recipes by a lot so my sensitivity to sweet foods is higher than most people. That doesn’t mean I don’t have a sweet tooth though. If you’ve been reading my blog for a while, you already know I love my sweets! I wanted to share something a little different than the typical pie recipes you are probably seeing around the Web right now. Since I grew up in Poland, I love sharing this little piece of myself and my culture with you! I have already shared a few Polish recipes, made healthier than traditional, because truthfully, Polish food is not very healthy at all haha. But just as with any other cuisine, there are ways to tweak it to make it better for you! 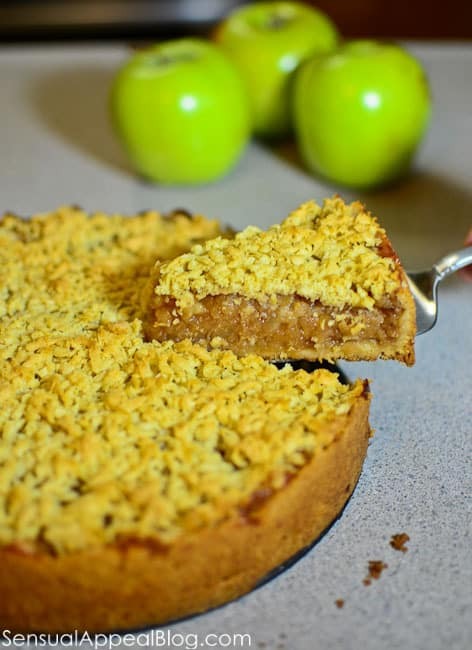 This Polish Apple Pie is a traditional pie named Szarlotka. 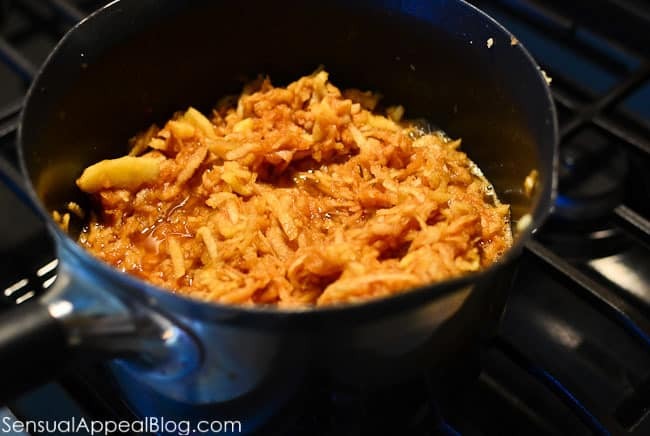 The only thing that is really different about it from the original recipe is the fact that I did not add any sugar when making the apple filling. The original recipe called for ½ cup sugar but I personally think apples are already sweet as they are (especially once you cook them and let the juices flow, makes it even sweeter!) and I like the crisp and tart twang these apples can provide this lovely apple pie without the sugar. I think sugar would camouflage the true flavors of the apples. If you dislike tartness in your pie or you just like your pie very sweet, you are welcome to add up to ½ cup of sugar to the apple filling as it’s being cooked. I thought this szarlotka turned out so great! There is a LOT of filling, which was perfect. I am also a huge fan of the crumble on top and the crust – it’s a very typical and traditional crust recipe but it is just so good. There are a lot of Polish cakes that involve making a crumbly topping like this and I’m thinking I might try making more Polish cakes in the near future. 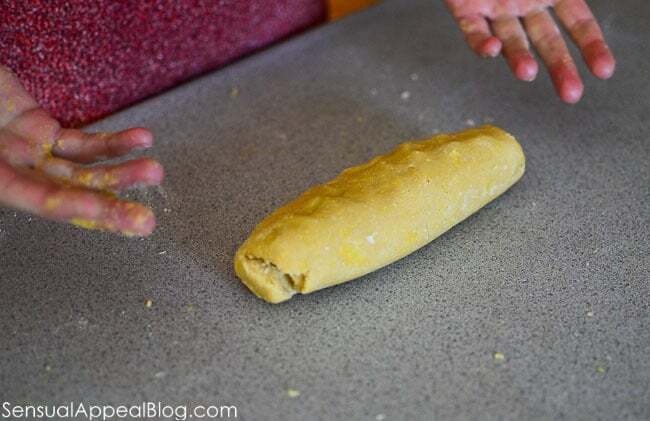 The only thing stopping me is that making the crust is a little tedious as you have to make sure you do not make the dough warm by overly touching it with your hands. You have to work very fast once you get to rolling the dough out. This recipe was slightly adapted from Gziki Pyry. Even if you don’t speak Polish you should check out the blog just for the photography – it is breathtaking! Also check out our honey szarlotka recipe with nuts and raisins – it’s yummy! Fantastic recipe! I have to make this for my Husband. I like to surprise him every now and again with a polish dish. Thank you for sharing! I’m book marking this recipe! Every time I post a Polish recipe, I think of you and your hubby! 🙂 Thank you dear! I’m sure he’ll love it. If he likes apples, he will definitely enjoy this! It’s one of my favourite cakes 🙂 Absolutely delicious. This looks delicious, definitely adding to my, must try list. I love pie, but agree withyou on the traditional American super-sweet pies. I like to be able to get the sweetness from the fruit! 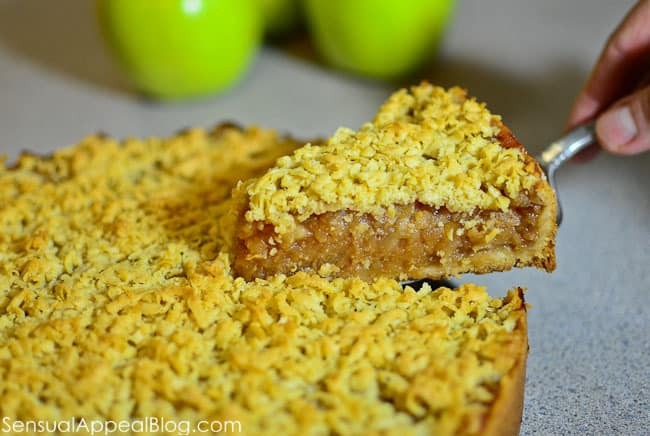 This looks delish – I love that you used apple sauce in the crust too! Szarlotka is, without a doubt, one of my favorite Polish snack recipes, but the recipe that my mom bakes with is so ridiculously unhealthy and delicious that we really have to limit how often we make it. I love the sound of your recipe, and I’ll definitely be filing it away for the next time the apple pie craving strikes. Yayyy! I know, the “real” traditional recipes can be pretty intense. Delicious! but intense and so not healthy. Sigh, but that’s why it’s made with special occasions in mind! Gotta love celebrations haha. I hope you try this one out next time, I think you will really like it! How beautiful is that?! Love that you went sugarless :-)! That looks so damn good! And I don’t know if I’ve mentioned before but you’re a great photographer. Really. You have an eye for intricate detail and lighting. You can tell you’re an artist. You are the SWEETEST, Yaara! Your comment made me blush 🙂 Thank you! I always wondered where the English dessert Apple Charlotte got its name. I reckon it is a bastardisation of the word Szarlotka and that the inspiration for the English dessert actually came from this one. Looks yum! I too never sweeten apple pies, or at least, very little (depends on the type of apple I use). I’m totally with you on American pies…heck, MOST American desserts…they are just TOO sweet! While I don’t have much of a sweet tooth, I can appreciate a good, quality dessert, but I just don’t want to feel like I’m slipping into a diabetic coma afterwards! I’ve literally felt dizzy after taking just one bite of a traditional American dessert! That’s ridiculous! Wow! This looks so delicious.. and perfect for Pi Day! My husband LOVES pie… so this is for sure on my list! That sounds AMAZING. And a happy pi day to you! I like pie myself, but I totally feel you on the sweetness thing. Letting the apples do their business sounds perfect! Yes! I’m glad you agree. Apples are so delicious all by themselves. Hey Kammie! This dessert looks sensational. I love any and all desserts with apples in it. Happy Pi Day! Looks and sounds delicious! I like a good apple pie. Pinning 🙂 Thanks for sharing at Healthy 2Day Wednesday. This sounds amazing! Pinned! 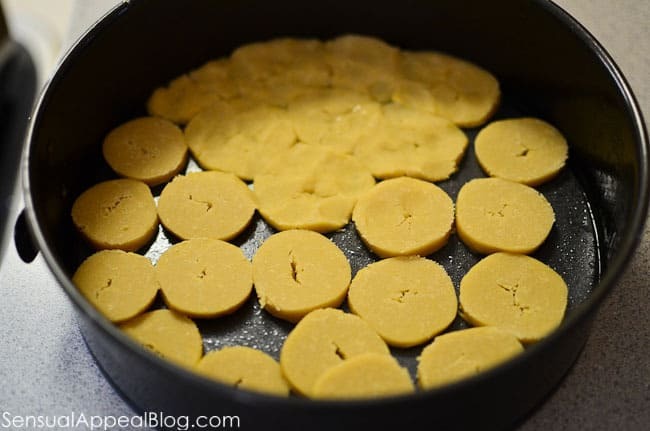 Thanks so much for linking up to Two Cup Tuesday at Pint Sized Baker. I look forward to coming back on Monday Night! 🙂 yay! That’s all I ever wanted! Glad you like it, Amber! Oh pie oh my !! My boyfriend is and apple pie addict. I will definitely have to try this one! !